Today we release the new module version, the TimePunch Cutter v3.1. The new version brings improvements in functionality and flexibility. The framework time model can now be assigned a transitional period in which the working time model is valid. This increases the flexibility of the model, since it is now possible to implement frame times that are only valid for certain periods of time. As an example, the frame time from 7:00 to 16:30 + 30 min. transition could be defined. A reduction is only made if the employee stamps “check out” between 4:30 pm and 5:00 pm. This variant also allows individual rounding settings, e. g. using frame time intervals or cascades. In the new version, different frame time models can be implemented per weekday. This makes it possible, for example, for employees to work overtime from Monday to Thursday, so that they can start the weekend earlier on Fridays. 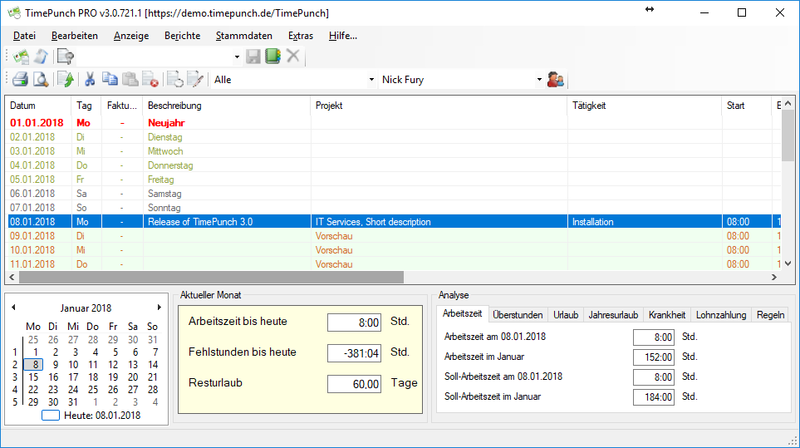 In TimePunch v3.0, working hours already reduced in the cutter were also used to calculate the night surcharges. This problem is fixed in the current patch. In the current version, TimePunch Studio can no longer be started via the client installation. This problem has been fixed. In the current version, the remaining leave of employees was displayed in the flextime reports instead of the annual leave. The problem, which is now fixed, was a pure display problem with no effect on the holiday calculation. During the permission check, an error occurred that made it possible for employees without authorization to see the posting reason (for example, leave). This problem has been fixed in the current patch. In TimePunch, past completed projects (i. e. projects with defined start and end times) were also displayed for booking. This problem has been fixed in the current patch. When importing project data, the maximum working time of the project pool was not imported correctly. With the current patch, the project data import works correctly again. This patch for TimePunch Studio Module 3.0 eliminates minor issues that have occurred in different installations. In version 3.0, TimePunch Studio could not be started in the tablet mode of a Windows 10 PC. This problem has been fixed. In the report filter, the tasks can now also be filtered using an input field. This simplifies the search if many tasks have been created. With TimePunch ONE it is now also possible to have travel charges included in the current patch. This means that the travel costs can also be charged to the customer. If working times were booked directly to a project, the cost factor for invoicing work at the customer’s premises was missing. The patch fixes this problem. When sorting the data after “Changed by” an error occurred and TimePunch was terminated. This problem is now fixed. If the Edit Time Entry dialog was closed with the Close button of Windows, the data in TimePunch’s main window was not updated. This problem is also fixed now. The reason for the sometimes very high memory consumption could be adjusted and fixed in the test. If no salary has been defined for employees, this value is no longer exported to DATEV Lodas. The PZE Online license could be assigned to the employee in license management, but it was not displayed in the employee profile. The first patch for TimePunch 3.0 eliminates minor issues that have occurred in different installations. Performance had deteriorated extremely during the reporting process when using local MDB databases. This issue is resolved with the current patch. When you import projects. CSV files, the start and end dates have not been correctly taken into account. The import has been corrected with the current patch. If TimePunch v 3.0 was installed on a completely new PC, then there was an error message if the watcher was started before the client. This problem has been resolved. If the fiscal year in TimePunch does not start at the beginning of January but, for example, already in December, the working hours during export to DATEV Lodas were not posted to the correct cost points. This issue is resolved with the current patch. TimePunch 3.0 is finally online! 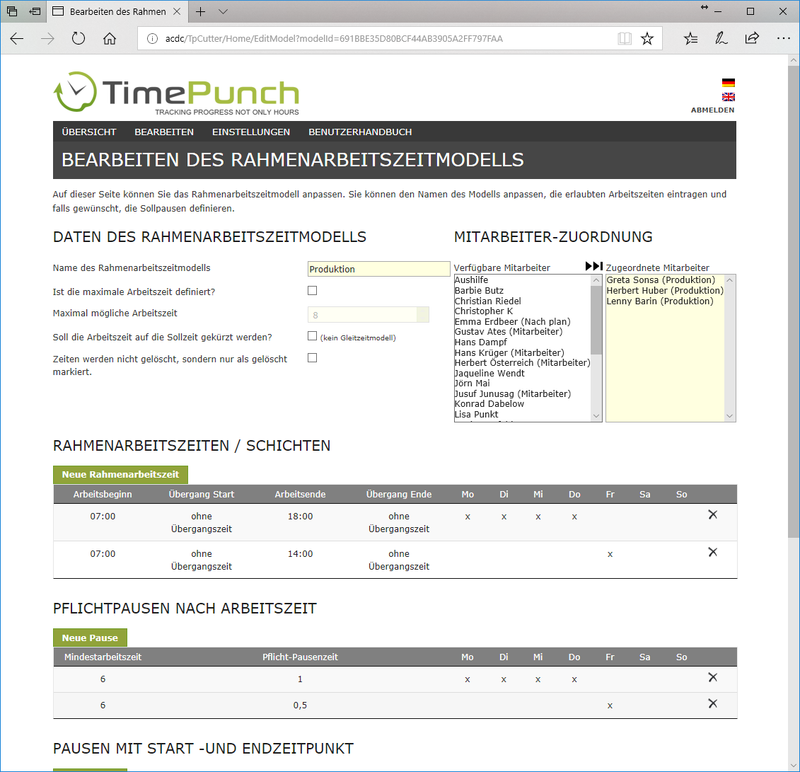 For the modules “TimePunch Watcher“, “TimePunch Studio” and “TimePunch Management” you no longer need a separate installation – with TimePunch 3.0 you can use the individual modules anytime and anywhere over the TimePunch Application Server. To make staff management even easier for you, team and department managers are now allowed to directly access the employees working hours. They don’t have to use the reports anymore. With TimePunch 3.0, holidays can also be represented as a regular working day. This makes it possible to record the hours normally, even on public holidays. In order to better reflect the reality for the project management, with TimePunch 3.0 project managers no longer have the right to change all projects. They are assigned to their projects and can only edit them. Reports no longer need to be reinstalled after a patch update. TimePunch 3.0 is in the starting blocks! But before the new version goes online on 08.01.2018, we have fixed a few bugs of the current version with our latest patch 2.95. In the holiday overview report, half holidays were sometimes incorrectly reported. This bug has been fixed – in the latest patch, even half-days are listed without errors. FS#768 – Export to Excel with annual leave and sick leave report. Die The annual leave and sick leave reports have been revised to export only the data (without headers and footers). This will allow you to filter and postprocess the cells in Excel in the future. The export to DATEV Lodas has been simplified. In the future, you can group time entries by wage type and add up the times. This makes it easier for you to check the working hours which are imported in DATEV.